Sadly, its not the same case for the generation today. In today’s world we are out to provide the best to our kids to help them get a good life. With the growing pollution we have to keep the kids safe. Here are some thumb rules to follow to help the kids live a safe a healthy life. As a mother of twins, my perpetual worry is to ensure the best of things for my boys so that they do not fall sick. Of late, I have consciously made that move towards leading a green life. Maybe its a fear of living at the time when water would be scarce, reading and watching on global warming, and so many things happening, that I want to give back whatever I can to the nature. And yes, I’ve been reading up lots on green parenting and green living. The change has been gradual but I am liking it and I thought of sharing some points that I have noted and followed all this time. Go the green way, opt for organic and natural goods that are good for your children. Indulge in green living and if you like something, do recommend it. It could help the other parents too. Organic cotton clothing is the best bet for kids, infants and even us! Yes, its a tad expensive but then if you want to make the difference, you should not really worry about the money. Organic cotton is not only comfortable but also easy to care and is available in most stores that sell organic and natural stuff. On one of my visits to the Omved store ( I can’t get enough of their prods! I probably need to start an Omved Fund to help me finance my purchases!! ), I picked up a very cute onesie for a baby that’s yet to be born. The onesie was made from special natural bamboo and certified organic cotton blend that is good for the tender baby skin. I totally loved the packing and the info that came in the packing can. These are available at Omved, a brand also sold by Natural Mantra. You have a lot of options to choose from when you talk of green games and toys. Keep away those plastic toys and choose the wooden toys because they are a healthier option. There is such a wide variety available in the green games. Puzzles, blocks, trucks, string games, the list is quite endless. There are some interesting string games that can keep your child occupied for hours together! The string games are generally made from organic materials like silk. These games are however not suitable for young children, due to choking hazard safety precautions. When you choose string games, select the ones that do not have dyes used in them. Buy board games that have been made from recycled paper. The organic board games also use soy based inks. You can read more about soy inks here. While bathing, use allergy-tested soaps and shampoos for your children that have natural ingredients. I love the Berry Mantra Bar by Omved for my boys. It is natural and has a very good fragrance. Most of these soaps have NO parabens, triclosan, sulfates, artificial fragrance or colours, glycols or animal products. They contain ONLY pure therapeutic-grade essential oils and natural oils. 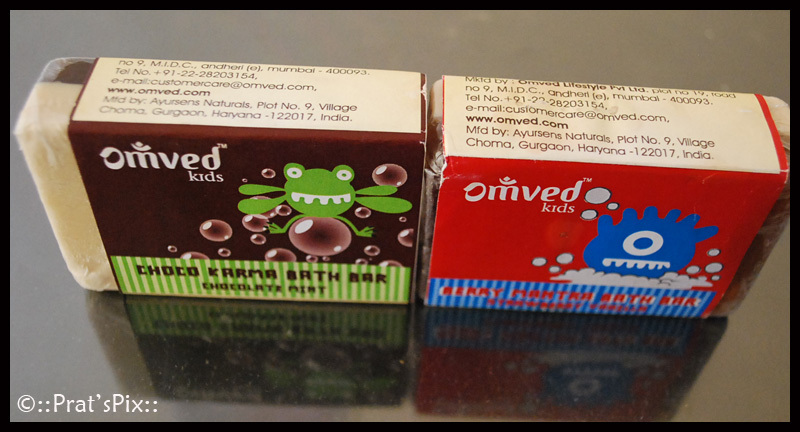 Most of the soaps from Omved are really nice! You can also select from a wide variety of shampoos that are available. Most of the natural products are stored in glass jars/bottles or recycled containers. Ditto for a powders and baby lotions that you would apply to your baby. There is also organic laundry powder avaialable in the market now. You know while they clean the clothes, the rinsed water can also be used for gardening! Use organic shampoos and face scrubs. I recommend face scrubs/ face wash because since they are natural, it is quite unlikely that it may not suit one’s skin. Did you More than 60% of what is applied on our skin gets absorbed into the blood stream? So choose your products wisely. Here is a link to an interesting article on what Natural Mantra calls the DIRTY DOZEN. If you like to indulge in gardening and have a garden, then ensure that you use organic pesticides in your gardens and the plant pots. There are so many snacking options available for kids today. Chocolates are given to my boys very rarely and honestly, they do not miss it. At least I would like to think that way, because they don’t ask for it much! Opt for healthy snacking like the new variety of baked chips available in the market. Yes, I do see many a raised eyebrow but I allow that indulgence because the snack is not fried! Fruits are the best forms of snacks, even if my boys want to miss a meal and eat a bowlful of fruits, I do not complain. Use organic pulses and curry powders in your cooking. They are a healthier option. Include organic muesli in your breakfast. It is healthy. Natural Mantra has an interesting array of healthy snacks on their site. Nothing calms me down more than an aroma that I totally love. Come evenings and I need to light up the diffuser and let one of my favourite fragrances float around in the house. Did you know that you can actually use essential oils to ward off the irritating mosquitoes at home? I have a collection of oils ranging from a fruity fragrance to energy and relaxation. These are things that I consciously follow at home. Do you do anything different? Let me know! thank u for all the useful information. another brand of clothes we buy organic clothes from is UV &W. I got clothes for myself , my daughter and oneies for a friends newborn form there. Bought it in punjab but not sure of its availability in other parts of the country. Thanks Sonia. Will search for this brand too! I have not come across this brand as yet.